Costa Rica vacations are popular with budget travelers from all over the world. Here are 20 illustrated quick tips for planning a budget travel experience in Costa Rica. Native Costa Ricans don't eat their meals in tourist restaurants with prices to match. They find restaurant Casados in what are called sodas (more below). Costa Rica vacations have been popular for several decades now. Why not? This beautiful country is rich in diverse plant life and wildlife. The landscapes are beautiful, even dramatic in places. It has one of the highest standards of living in Central America, but the average citizen is not buying $10 appetizers and $40 entrees in trendy tourist eateries. 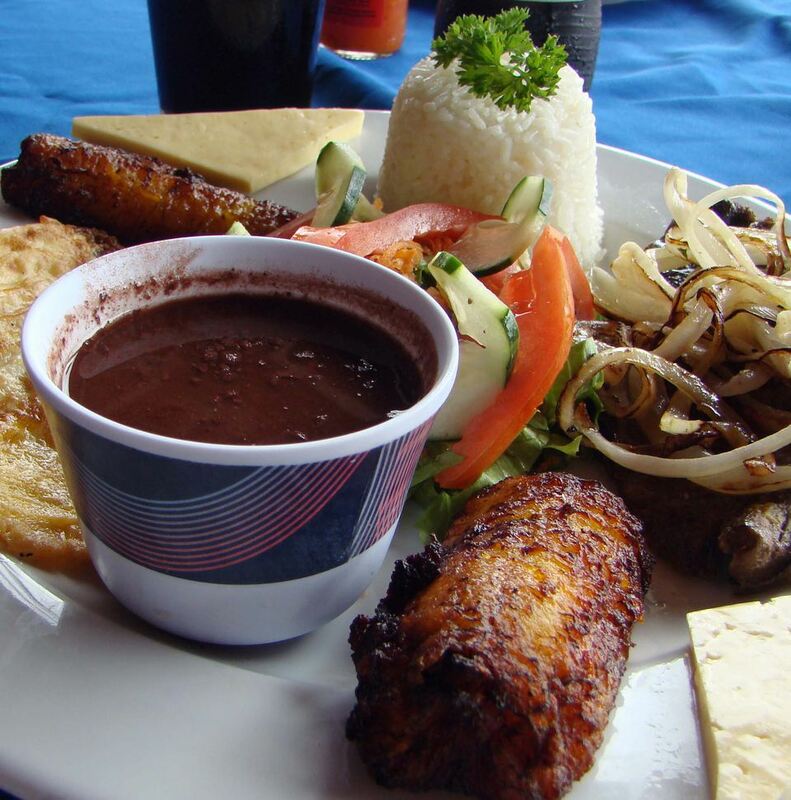 People eat delicious but reasonably priced meals in the ubiquitous sodas of Costa Rica. Finding a soda here has nothing to do with soft drinks. It is a small restaurant or food stand that offers modest but often delicious Casados at affordable prices. Casado roughly translates to "typical meal of the day." The Casado pictured here fits that description: red beans and rice, fried plantains, grilled onions, cheese and a small piece of steak might constitute one of these meals -- often available for as little as $4 USD. Eating every meal this way could become bland. After all, these plates look very similar from town to town. But a few cheap, filling Casados will do wonders for your budget. Make it a point not to miss breakfast in Costa Rica. It's always important to eat breakfast on the road, especially when it comes with the price of your room. But Costa Rican breakfasts are a part of the overall experience, and they often sustain you enough to aid in turning down expensive lunches. The $5 USD breakfast pictured here is served at bed and breakfast in Playas del Coco, on the northwest coast. The owner of this small establishment prides herself on preparing memorable breakfasts, borrowing recipes from Emeril that are enhanced with a few of her own special touches for good measure. At other B&Bs, you'll sit on an outdoor patio and watch wildlife as you eat. Nearly everyone hikes the rain forest in daylight, but are you up for a night tour? Don't venture into the rain forest at night alone. But if you're willing to part with about $20, you can arrange a guided tour in total darkness. Nocturnal creatures make the experience completely different from a daytime visit. The tarantula seen here is not likely to pose for a picture during daylight, but the guide on this trip knew just where to look for a photo op after sundown. Tarantula bites are venomous and sometimes painful but rarely fatal. By contrast, some kinds of harmless looking centipedes in Costa Rica could kill you within minutes. Also observed on this night: a scorpion (non-lethal but painful sting), a white owl and a host of smaller insects. But when you get home, it's likely one of your lasting Costa Rica vacation memories will be training a flashlight on a tarantula. All over the world, you can pay big bucks for a zip line tour. In Costa Rica, the costs and the experience are far more favorable. Zip lines have opened and flourished all over the world. The first place they became popular was Central America. In many parts of Costa Rica, you will choose between several nearby zip line tours. Another frequent name for this type of experience is canopy tour, but the terms are not synonymous: remember that some canopy tours involve hanging walkways and not necessarily a zip line ride. It's not uncommon to pay $100 or more in many areas for a zip line tour. This picture was taken at the Congo Trail Canopy Tour, a short drive from Playas del Coco. The cost here can be as low as $25 USD in the off season, but transportation often runs another $10 or so. What better way to experience zip lines than in the place of their origin and at a fraction of the prices found elsewhere? When you see people gazing intently into a tree, rain forest or meadow, chances are good you've stumbled across a chance to observe something fascinating. At a rest stop en route to the Pacific coast, we observed people pointing at the branches of a huge shade tree. A glance upward revealed a family of macaws, the colorful bird pictured here. The distinctive colors and loud squawk will provide cheap entertainment for a few moments of your Costa Rica vacation. It's more difficult to spot the resplendent quetzal, with its long forked tail feathers and bright red chest. If birdwatching isn't your passion, how about lazing for a while with a three-toed sloth or observing crocodiles from the safety of a highway bridge? Colorful butterflies and green iguanas are likely to cross your path at some point in your travels, too. Bring your camera and don't be in too much of a hurry. It's another unique Costa Rica vacation experience that comes at no additional cost. Not every Costa Rican beach is ideal for snorkeling, but locals can usually identify a cove not far away where you can enjoy the depths without paying big fees. I was ready to plunk down $35 USD and join a scuba trip in which snorkeling was also offered off the Pacific coast. Any number of places in Playas del Coco offered such trips, and I'm sure it would have been enjoyable. But in a short period of time I had several activities I wanted to pursue, so a short beach snorkeling experience was also attractive to me. The beach at Coco is not a snorkeling destination, but after talking with an American ex-pat for a few minutes, I spent $5 for a short cab ride to Playa Ocotal. Here, I was able to find other snorkelers who directed me to a very good site. Your time constraints and snorkeling interests will differ, but it always pays to ask someone who doesn't stand to profit from your decision about potentially free activities such as snorkeling. At Arenal Volcano National Park, you can see and hear volcanic activity from a safe distance. Let's dispense with any misconceptions: you cannot climb the Arenal volcano, and you're not going to get much closer than about two miles from the mountain. Although officially classified as an active volcano, visible eruption activity has been minimal since late 2010. The area receives about 15 feet (yes, feet) of rain a year, and the summit is frequently obscured in clouds. If you're still interested in coming here, the rewards can be astounding: it's possible to hike safely and see evidence of past lava flows. Tip: If you see the summit, don't assume that image will be available to photograph even a few seconds later. Cloud cover moves in quickly. Hiring a guided tour is a great way to visit the surrounding national park. But with your own transportation, it's possible to visit for a small entry fee and then hike a well-marked and flat trail to the outflow from a 1993 eruption. It's not a good idea to leave the marked trail or to forget your rain gear. Arenal is home to more than a volcano--its volcanic hot springs attract international visitors all year. The town of La Fortuna became a tourist destination after the Arenal volcano erupted in 1968. In the quiet days before that first event, rural youngsters taking lunch to their working fathers discovered the waters through which they walked barefooted had gone from cold creeks to warm to hot. In the years that followed, someone discovered that lush landscaping and a nice long soak in these delightful waters would appeal to visitors. In fact, these volcanic hot springs have become just as important as the volcano itself. One option is the plush setting at Tabacón Grand Spa Thermal Resort. Here, you can look into booking a five-star room (sometimes for less than $150/night), or pay for a $70 visitor's pass. Too much? Another option that is less exclusive is to book a cheap room in La Fortuna and then visit another a garden spa called Baldi Hot Springs and Spa. The cost here is $17, and it can be booked as part of a larger tour. Baldi tends to be more party-friendly and crowded than Tabacón, but a nice soak near Arenal has become one of Costa Rica's must-do experiences. Serious surfing brings a lot of budget travel business to Costa Rica. As with snorkeling, it pays to ask locally about the best places for surfing. A few places have serious surfing reputations: Jacó, Mar Azul and Tamarindo are well-established surfing destinations, as is Malpais to the south. Surfers visit the Caribbean coast as well, especially in the area of the "Salsa Break" near Puerto Viejo. If you're a surfer, check fares into Liberia, which is an international airport not far from the northwest Pacific coast. It's only about an hour from there to Playa Blanca and Ollie's Point. For more company and a true surfing community, Jacó is often the choice. The area offers some smaller, fairly spartan accommodations for surfers on a budget. Costa Rica didn't start establishing national parks until 1955, but they've certainly made up for lost time. Costa Rica is about the size of West Virginia, but it has 25 national parks and many more protected areas (136 to be exact) in which development is not permitted. The result is more than 25 percent of all the land area fits this general description. As with national parks in other countries, the idea here is to preserve the land and allow visitors access to its beauty at reasonable prices. Many come here for eco-tourism, but many others head to the beaches or to the capital of San José without paying as much attention to the parks and the value offered. Spend part of one day walking the hanging bridges at Arenal Volcano National Park. Take another day to explore the riches of Manuel Antonio National Park for just $7 USD/person. Pick a day when clouds are high in the sky, stake out a good coastal spot, and wait for the wonders of a Costa Rican sunset. The picture above was taken on Playa Hermosa. El Velero Hotel on the beach allows visitors who are not staying with them to use beach chairs that become available. On this day, one such chair provided a vantage point to watch an entertaining show. Young people gathered to build a bonfire on the beach. Others were towed across the surf on a giant raft built to fit four passengers. But the main attraction was the simple setting of the sun on the Pacific horizon. During those fleeting moments prior to sundown, there were plenty of pictures to take and rapidly changing, colorful reflections in the high clouds. To miss this spectacle is to deny yourself one of the finest free pleasures of a Costa Rica vacation. Plan for it, stake out a spot and enjoy. Costa Rica's challenging roads don't always make an attractive place to ride a bike, but off-road mountain bikes are popular choices. In these days of rising baggage fees, it makes little sense to lug a bicycle to your destination unless you're in a special class of cyclist. For most of us, a cheap one-day or hourly rental can provide plenty of benefits. But in Costa Rica, many of the roads are in poor condition. In rainy season, some are impassable. So why advise riding a bike? Sometimes, distances of just a few miles are more practically covered by bike than worrying about the expense of a car rental. But any Costa Rica vacation also presents off-road mountain biking opportunities. At La Fortuna, you can rent a bike by the day for under $25. Local buses are some of the best travel bargains in Costa Rica. Learn to use them. When you proceed from Alajuela, home to Costa Rica's largest airport, to Arenal, home of Costa Rica's most famous volcano, you have a transportation choice. You can arrange a comfortable minivan ride that will deliver you door-to-door for about $40, or you can take a local bus for roughly one-tenth the cost. The local bus takes a little longer, but it travels through some intriguing countryside featuring foggy mountaintop villages, lush hillside coffee plantations and friendly but modest villages. You'll stop at bus stations that open a window to view daily Costa Rican life. The bus ride is priced to match the wages of local people. Take advantage of the low cost, but don't fail to enjoy the surroundings and the people you will meet along the way. Avoid long car trips and you'll save time for more entertaining moments. Taking a road trip during your Costa Rica vacation can be a rewarding experience, but it's also likely to take longer than you'll expect. Road conditions vary greatly, but often fall short of what is required for timely travel. Rainfall totals that often exceed 30 in. in two months don't help much. A well-placed short flight in your itinerary can buy you an extra day to linger at the beach or explore the cloud forest. Costa Rica has two domestic airlines: Nature Air and Sansa. Booking a flight from Liberia to San Jose on Nature Air's colorful aircraft turned a five-hour road trip into a 45 minute aerial tour. Cost: about $100 USD before taxes. A brief boat trip can save you time on steep, rutted roads. Many visitors to Costa Rica will have occasion to travel between Monteverde and Arenal. As the crow flies, the two destinations are so close together that you can hear the Arenal volcanic eruptions from Monteverde. But there is no convenient, direct road between the two attractions. The circuitous drive involves using mountain roads that are steep, winding and rutted. Drivers can only proceed at a slow pace or they risk major suspension repairs -- maybe worse. But it's possible to minimize your travel time on those roads by simply crossing Lake Arenal. Companies have sprung up that will book your taxi-boat-taxi passage. It might be slightly more expensive to travel with the boat segment, but the time and consternation saved are well worth the investment. The views of Arenal on a clear day from the lake are a nice dividend, too. The snacks you'll buy in touristy areas are priced for vacationers. Instead, pay local prices in the supermarket. One of the great cultural experiences of visiting any new location is a visit to the grocery store. Sound dull? Most of the time, it's quite revealing. You'll see which foods are featured on local tables. You'll observe families doing their shopping. Best of all, you'll pay the prices reserved for residents. That $3 can of Diet Coke on the beach will cost a lot less in the market. In my experience, people are often impressed that you've ventured into their world. They'll strike up conversations and offer advice on living well during your stay. Rooms with a view don't always come with a huge price tag in Costa Rica. Views are commanding from rooms at Villa Casa Blanca in Playa Ocotal. The small hotel sits atop a hill not far from the Pacific. The place has its own open-air patio and a nice pool area. Rooms here, especially in the off season, are often less than $100 USD/night. To be sure, budget travelers can find less expensive rooms in the surrounding area. But many would also expect to pay much more for such delightful amenities. The lesson: don't be afraid to consider all the lodging possibilities while visiting Costa Rica. Some you might initially believe to be out of your price range might work out quite well. Another level of budget lodging brings some comfort, but certainly no frills. Hotel El Sueño in Santa Elena, Costa Rica (near Monteverde) will never be mistaken for a five-star property. The quarters for rent are small. No televisions, telephones, desks or fancy sitting areas will be found in these rooms. The walls, ceilings and floors all look the same. Furnishings are worn. It's basically a clean, quiet place to sleep for the night. But unlike the lowest priced budget rooms, this one has a private bathroom with a hot shower. The cost in the off season is under $40 USD/night, including a hot breakfast cooked to order. There was even a choice between eggs and ham or the traditional gallo pinto (rice and beans) breakfast that is so popular here. Doing without frills doesn't mean you'll go hungry! Cold water is a bargain in Costa Rica. If you're willing to do without hot water for a night or two on your Costa Rica vacation, accommodations can be booked for less than $10/night. It's certainly not a given that hot water will be available at all times of day at a budget hotel here. Frankly, the quality of lodgings at these prices might not meet expectations. Some lodgings offer concrete floors and little protection from outside intruders or critters. So it pays to ask your host or hostess about such things. But if you're low on cash and willing to forgo a hot shower for a night, $10 per person (maybe even less) is what you should expect to pay. Finding bargain flights to Costa Rica is easiest in the summer and fall. Round trip flights between North America and Costa Rica during the off season can be as low as $250 USD. Before you click "buy," understand that the months of September and October are quite rainy in many parts of the country. Rainy season (or green season as the public relations people like to call it) often involves more than dodging a few showers in the afternoon. It means frequent all-day rain. In a country where most of the tourist attractions are outdoors, this can be troublesome. But if you don't mind packing some rain gear, you'll love the airfare bargains. Summer flights will cost a bit more (but under $400 round-trip at times from Miami or Chicago), but rain at that time of year is often limited to a few hours rather than a whole day. The price difference for a summer round trip is worth considering. By the way, monthly temperatures vary much less than precipitation totals.